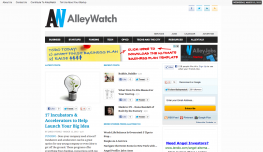 AlleyWatch is the destination for startup news; opinions and reviews; investment and product information; profiles of the companies and the players; and events highlighted and reported, experienced and seen, heard and overheard here in New York and beyond. But it’s who we are that’s makes us different: we’re the writers and the entrepreneurs; the investors and the mentors; the lawyers and the marketers; the realtors and the recruiters – the people who work in the industry. Which makes our content the insights and observations of startup scene insiders deconstructing the systems we inhabit to tell the stories as no one else can. We want to hear about your trials and triumphs, your battles fought and lessons learned: the stories that go untold from the people who go unnoticed. AlleyWatch is here to fill the gap in startup coverage with news, resources and information to connect the community here in New York, the city that never sleeps, filled with dreamers who don’t stop until the world wakes up and takes notice.